When we look at the world around us and even in the Body of Christ, it appears more importance is placed on who man is, rather than who Christ is? Our messages are centered on us, how wonderful we are, how amazing we are, and what we can do to improve ourselves, on and on. However, I have found the Bible’s centerpiece in heaven and earth is not centered on man at all, but on His Beloved Son, our Lord Jesus Christ. He is the one celebrated by all of creation more than man. He is talked about, honored, glorified, adored, and focused on more than man. King David, who loved God with all of his heart, asked the question about man and his role in the universe. 3 When I see and consider Your heavens, the work of Your fingers. The moon and the stars, which You have established. 4 What is man that You are mindful of him, and the son of [earthborn] man that You care for him? 5 Yet, You have made him a little lower than God, and You have crowned him with glory and honor. 6 You made him to have dominion over the works of Your hands; You have put all things under his feet. 7 All sheep and oxen, and also the beasts of the field. 8 The birds of the air, and the fish of the sea, whatever passes through the paths of the seas. 9 O Lord, our Lord, How majestic and glorious and excellent is YOUR NAME in all the earth! Hateful Grasping for Life Hideous. When Adam sinned, because he disobeyed our Father, he gave his rights and authority over our Father’s creation to sin and the evil one. Sin ruled and reigned over our Father’s creation throughout history because of Adam’s disobedience. Nothing on earth is as our Father first created in the beginning. Everything is out of order, dying, and decaying. But, Jesus Christ, the God-Man, came into the earth as the ‘Last Adam’ to regain the rights and authority from sin and the evil one and to restore ALL things back into the order the way our Father intended. Philippians 2:8-11 (Amplified) After He was found in [terms of His] outward appearance as a man [for a divinely-appointed time], He humbled Himself [still further] by becoming obedient [to the Father] to the point of death, even death on a cross. 9 For this reason also [because He obeyed and so completely humbled Himself], God has highly exalted Him and bestowed on Him the NAME WHICH IS ABOVE EVERY NAME (EVEN ADAM), 10 so that at the name of Jesus every knee shall bow [in submission], of those who are in heaven and on earth and under the earth, 11 and that every tongue will confess and openly acknowledge that Jesus Christ is Lord (sovereign God), to the glory of God the Father. Ephesians 1:22-23 (Amplified) And He put ALL THINGS [in every realm] in subjection under CHRIST’S FEET, and APPOINTED HIM as [supreme and authoritative] head over ALL THINGS in the church, 23 which is His body, the fullness of Him who fills and completes all things in all [believers]. 2 Corinthians 4:5-7 (Amplified) For we do not preach ourselves, but Jesus Christ as Lord, and ourselves [merely] as your bond-servants for Jesus’ sake. 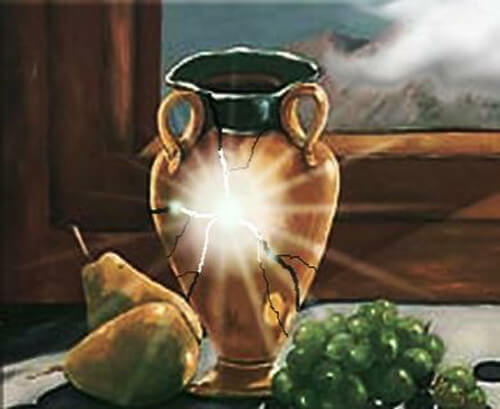 6 For God, who said, “Let light shine out of darkness,” is the One who has shone in our hearts to give us the Light of the knowledge of the glory and majesty of God [clearly revealed] in the face of Christ. 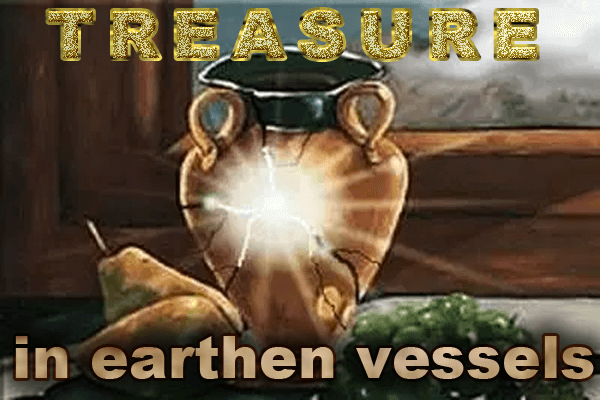 7 But we have this PRECIOUS TREASURE THE LIFE OF THE GODHEAD in [unworthy] earthen vessels [of human frailty] so that the grandeur and surpassing greatness of the power will be [shown to be] from God [His sufficiency] and not from ourselves. Man was Chosen as a Son, a Vessel or Container To Allow the Godhead to Express Themselves in and through Him. 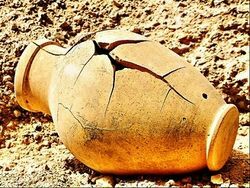 However, whenever man, embraces his human identity first as being just a frail, weak, fickle, and broken cracked pot, hewn, and fashioned by the hands of his loving Father, Abba (my Papa), then and only then can he FULLY REST and DRAW LIFE from HIS TRUE IDENTITY… CHRIST IN HIM. So that the GRANDEUR and SURPASSING GREATNESS OF THE POWER will be from God [His sufficiency] and NEVER FROM OURSELVES.